But I haven't seen this interior before. And I do see that Chrysler logo on the steering wheel. As well as the analog clock. But it isn't the "dead" Chrysler 200. And not the Pacifica either. Chrysler has nothing coming up. Except a small refresh to the 300. That is not a Chrysler interior. 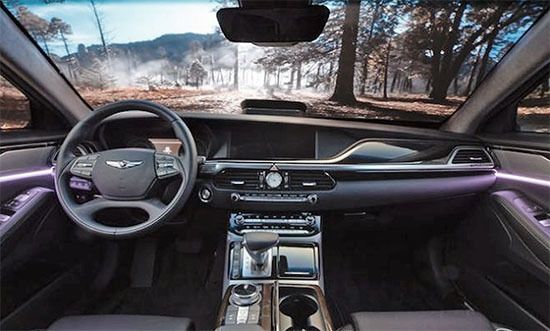 Look closely at the logo, it's a Genesis and you can also tell by the shifter and how the center console is slightly higher where it connects to the dash something that is common with other Genesis interiors. That's the Genesis G90 interior. That looks like the Genisis logo. Looks like that's Genesis G90 interior. Come on,Vince.This is obviously a Hyundai Genesis. Wake the f#ck up. That is not the current chrysler logo. they did away with the circle "medallion" in the middle years ago. *apologies - typed my first comment and immediately realized the typo. It's the Genesis G90. That's the Genesis logo and everything. Nothing is different about it. Vince are you drunk? That is the Genesis G90 interior, you can even see the Genesis logo on the steering wheel. Vince, do you think Fiat will kill Chrysler and just sell Fiats along with Rams in North America? Genesis G90 ? (the $70,000.00+++ version) Chryslers are often mistaken for cars in that price range. But this is not a Chrysler. Genesis G90...Chrysler would be so esteemed. Dude Vince, are you serious right now. That's the Genesis G90. No way Chrysler would come even close to making something like that. It's not a Chrysler logo. That's a Genesis logo. It's the Genesis G90. No Chrysler here. Are you sure this isn't a Genesis? Isn't their logo similar? It's probably a Genesis product, look closely at the logo, and just the overall design of the cabin. Vince. You should be ashamed of yourself. Any car buff can tell you that is obviously not a Chrysler logo, but the Genesis logo. In fact I went to check images of the G90 sedan, and it is actually it! Looks like a Hyundai interior. Looks like a Genesis brand logo. Looks like G90 interior. You've never seen this interior before? Are you sure that's not a Genesis? That's the Genesis logo on the steering wheel. This is a GENESIS, not Chrysler.... look at the steering wheel. Is that not a Genesis logo? I don't believe that is a Chrysler. Vince, isn't that the new Genesis G90 interior? This is the Dashboard of the new Genesis G90. So this is no Chrysler at all. Genesis and Chrysler happen to have a similar logo. That is the Genesis G90 interior, not a Chrysler. Looks more like the Genesis wings in my opinion! It is clearly one of the Genesis models. The logo is strikingly similar to that of Chrysler's from a distance. Genesis G90 Vince. But when you consider that this is in fact the luxo Hyundai, suddenly Chrysler seems even sadder and less relevant. This is the Genesis G90. That's not a Chrysler logo, it's a Genesis logo. That's the interior of a Genesis G90. That looks like a Genesis logo on the steering wheel. It's the interior of Genesis G90 (known as Hyundai previously). That's a Hyundai G90 interior. It's an old Hyundai Genesis interior. Are sure that's not a Genesis' logo? Looks like the emblem on the steering wheel is that of a Genesis. Isn't that a Genesis (Hyundai) interior? This is a Genesis interior. It's using the standard hyundai/kia controls . That's the interior of a Genesis G90 photoshop. Isn't that the genesis logo? That's an interior for Genesis! It's the Genesis G90, Vince. It is a 2017 Genesis G90. I knew I saw this before. The logo shape on the steering wheel looks very similar. This is a 2017 Genesis G90. Look closer. That's a Hyundai Genesis logo on the steering wheel. This is a Genesis G90. Steering wheel logo is very similar to the Chrysler logo. Um, isn't that a Genesis logo on the steering wheel? Genesis G80 is what you are looking at. If the next 300 looks nearly as good inside, FCA will have a winner. It is the interior of genesis G50 lol.. I THINK THIS CAR MAYBE A GENESIS. Winged badge confused me at first too, but this is not a Chrysler... that's the interior of the production Genesis G90. Isn't that the Genesis G90 interior? Vince, please stop. You know it's the Genesis G90. Isn't this a Genesis (Hyundai) interior? Genesis, Bentley, Chrysler, MINI (and others)... all use 'Flying Wings' as their corporate logo. VERY confusing (to say the least).